Do my wisdom teeth really have to come out? This is not an easy question to answer, but the answer is usually yes. It is thought that we have wisdom teeth (or third molars) because our ancestors did not have the same oral health as we now enjoy. They may have lost one or several teeth by the time they reached age 17-25 and wisdom teeth were nature’s answer to replacing the lost teeth. Early man’s jaws were also larger and better able to accommodate more teeth than ours are today. Most of the time, wisdom teeth will not have enough room to come up out of the gums and function as chewing teeth that the patient is able to clean. If there is not enough room for the tooth to come all the way into place, it is called “impacted”. An impacted tooth may come part way through the gums or may stay totally below the gums. Infection – which can and does develop into life threatening infections because the teeth are so close to the airway. By the time wisdom teeth have fully formed for 12 years, 67% of patients will have had one or more of them removed. It is estimated that 85% of wisdom teeth will have to eventually be removed. This begs the question, why not take them out when the risks of removal are less and the recovery is faster? There is no question that removal of wisdom teeth has inherent risks. These could include bleeding, infection, damage to adjacent teeth, and dry socket as well as nerve damage. These risks increase by approximately 1.5 times if a patient is older than age 25 and increase even more after age 35. Recovery is also longer and surgery more difficult for older patients. 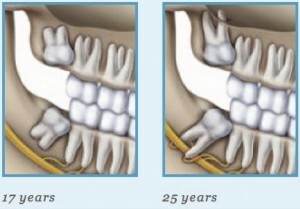 The best time to remove wisdom teeth is when the roots are 1/2 to 3/4 formed. This way, the roots are further away from nerves, the bone is softer, and they can be removed with less surgical trauma. Recovery is faster and risks are minimized. Occasionally, wisdom teeth are best removed by an oral surgeon that specializes in this area. At Sun City Dental, we are able to remove wisdom teeth for the majority of patients. We offer all forms of sedation in office so that you are comfortable throughout the procedure.